Gray Line Tours of Hong Kong Limited has been in the travel industry since 1959 and running business under the Travel Agent License No. 351803. For the past six decades, we have been operating under the renowned brand name “Gray Line” franchised from Gray Line Corporation, Colorado, U.S.A. Gray Line is a worldwide leading organization and the most well-known consumer brand in sightseeing tours. Mr. WU Kuok Ieng and Mr. Michael WU Siu Ieng, BBS, MH, JP, became owners of the business of Gray Line Hong Kong in 1993. Since then, Gray Line Hong Kong continued to provide quality and professional travel-related services to tourists. 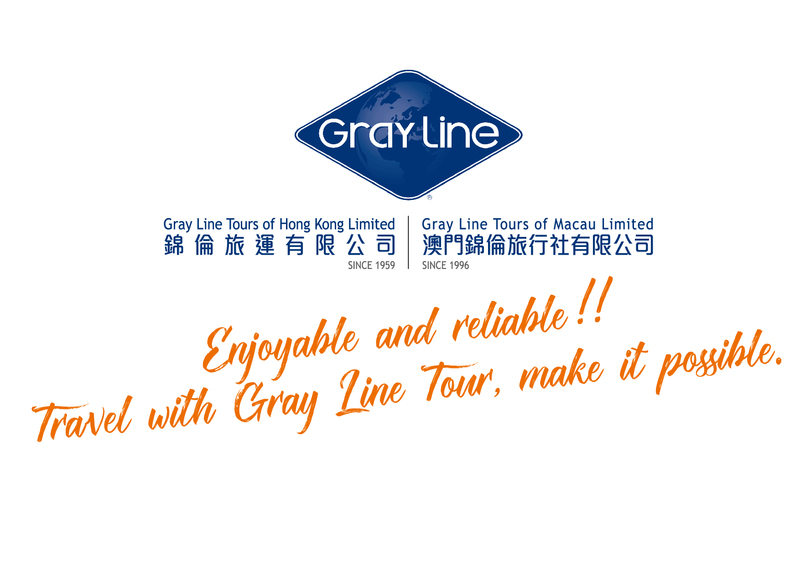 To meet the changing market needs, we established Gray Line Tours of Macau Limited in 1996 with the license from Gray Line Worldwide and expanded our business to Macau under the “GRAY LINE” trademark and holding with Travel Agent License No. 0054. Now, Gray Line Hong Kong comprises a group of companies with headquarters based in Hong Kong and subsidiaries in Macau. We have a total of 180 staffs, half of them with 15 years of experience in the travel industry. Our group owns a fleet of about 30 tourist coaches and limousines for services. At the moment, we have over 14 tourist service desks located at different hotel lobbies, and have been appointed by MTR Cooperation as the Tourist Services counter operator at four different ports of entry in Hong Kong. Regarded as a prominent player of local travel, we are dedicated to provide tourists with the best travel experiences. Our mission is to provide quality services to our customers and assure them to have an enjoyable and reliable trip. Gray Line Hong Kong is envisioned to provide a one-stop solution and convenience to tourists from all over the world. 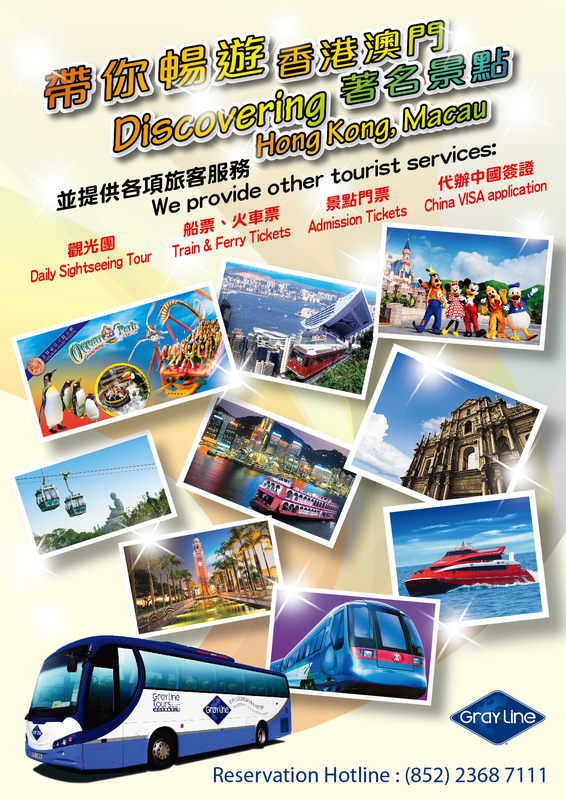 Daily Sightseeing Tours – With over 18 sightseeing tours conducted in either English or Mandarin in operation daily and over 100,000 visitors served annually, Gray Line Hong Kong has been a key contributor to the tourism industry in Hong Kong. Our products have been recommended by over 70% of hotels in Hong Kong, Hong Kong Tourism Board Visitors Information & Services Centre and local travel agents. Theme Parks, Attractions and Transportation Tickets – Other than daily sightseeing tours, we also specialize in ferry, train, bus and theme park ticketing. From attractions like Hong Kong Disneyland, Ocean Park, Ngong Ping 360 Cable Car to transportation like Airport Express, Turbojet (ferry between Hong Kong and Macau), other ferries to Pearl River Delta area, Intercity train ticket between Hong Kong and Guangzhou and High Speed Rail ticket between Hong Kong (West Kowloon Station) and other cities in Mainland are available for customers. M.I.C.E. Services – We are now expanding our already solid inbound destination services for both corporate and leisure visitors from all over the world. With our professional and experienced staffs in serving clients, in particular the M.I.C.E (Meetings, Incentives, Conventions, Exhibitions) market. The services that we offer to clients including Meet & Greet VIP service at airport, hotels reservation, transport arrangements, tailor made travel packages, event organizer…etc. We are dedicated to serving you of your special travel requested to ensure your trip is memorable. Free and easy packages – Going forward, we are going to develop different Hong Kong – Macau “Multi-Destination” free and easy combo packages including a combination of local transportation, ferry tickets, attractions tickets, show tickets and city tours packages that will allow travelers to visit both Hong Kong and Macau in one go. Safe Travel – We believe that an enjoyable travel experience is impossible without travel safety. All theme parks, scenic spots, transportations and restaurants appointed by our company are properly licensed to operate and with the necessary insurance procured. Besides, Gray Line Tours has purchased HK$12,000,000.00 Public Liability Insurance for tours’ participants.